After the long mild days, the real winter had finally come and gone! We were very sorry for the closure for 2 days due to our illness. We are already recovered well. 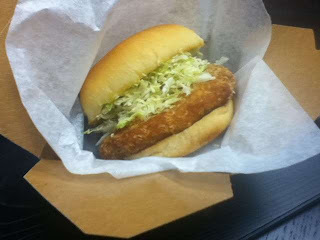 We introduce our Pork Katsu Burger at this time. What is Katsu? It is one of the most popular Western-style Japanese foods, breaded pork just like German schnitzel, but a bit different! It comes with special yummy sauce and best match with fresh shredded cabbage. People who have tried this burger are definately addicted. Did you know that Katsu has another meaning of winning or victory? Therefore we eat Pork Katsu right before exams, sports games or important business meetings to get a big luck! Let it bring you a big win to eat our Pork Katsu burger! Don't miss the daily special offer only for our facebook fans and twitter followers!